A Kinescope find from the Internet Archive. 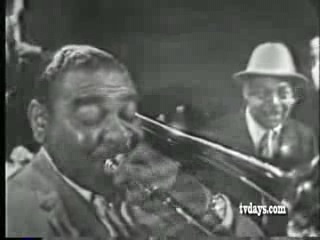 The “Art Ford Jazz Party” aired on the DuMont Television Network. Included in the frontline is trombonist Tyree Glen and saxophonist Coleman Hawkins. The rest of the very strong line-up: Teddy Charles (vibes), Hank Damico (clarinet), Mary Osborne (guitar), Johnny Windhurst (trumpet), Morey Feld (drums), Todd Colberg (bass), and Alec Templeton (piano). Pianist Roland Hanna (Later Sir Roland Hanna) and singer Maxine Sullivan also make appearances later in the program.